The Democratic and Republican primaries offer two different visions of how Corporate America – the US capitalist class – sees a way forward; how they see resolving their problems. Their main problems are increased frustration and anger at home and waning power abroad. One wing of the US capitalist class – mainly the newly rich – sees the solution as being a reversion to the policies of George Bush, but on steroids. In the main, they are backing the Republicans, and it shows. The Republican primaries can basically be called throwing them red meat – increasingly bloody and aggressive sound bytes. The Democratic “debate” last night put on a display of a more strategic approach. 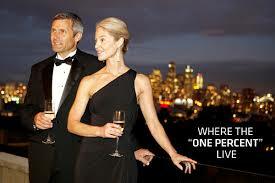 “The billionaire class”. They are generally hated today. All the candidates talked about income inequality, the need to raise the minimum wage, paid family leave, etc. In other words, the themes that Bernie Sanders has been concentrating on for months. Alone, Sanders attacked the “billionaire class”, but his proposals weren’t all that different from the others. One thing they all agreed on is the threat posed to the United States by… the Republicans! The great majority of Corporate America recognizes the threat posed by global climate change, so all the candidates paid homage to that threat. But integral to that threat is the ongoing disaster of fracking. 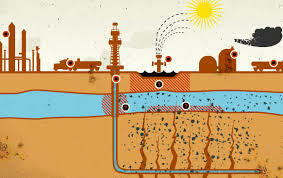 Since fracking is so central to the interests of US capitalism, that “must” be allowed to continue. As a result, not a single one of the candidates (including Sanders) mentioned this disaster. The discussion on foreign policy was defining in some ways. The general theme was the necessity of working with “our allies” in the region, which means the different states like Saudi state – one of the most reactionary and repressive ones in the world – and the best way to oppose “Putin”, meaning Russian capitalism. There was a fair bit of discussion on what to do in Syria, but no solution was reached. The reason is that they all – to the very last candidate – see the issue as one of how the different regimes can work out their interests. Not a single candidate sees the working class majority in the region as being the subject, the actors, on the stage of history; for all the candidates the working class majority is just an object of history, just props on the stage. 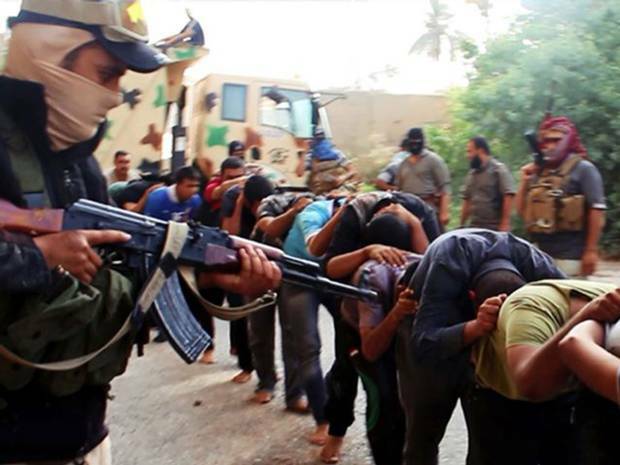 Islamic State soldiers with captives. Their rise was only made possible by the situation on the ground in the region. The people of the region are not simply objects of history; they are the subjects. In other words, “come together”… to vote in more Democrats. Just a few days before this “debate”, the Wall St. Journal published an article on “America’s Fading Footprint in the Middle East”. They wrote: “As seasoned politicians and diplomats survey the mayhem, they struggle to recall a moment when America counted for so little in the Middle East—and when it was held in such contempt, by friend and foe alike.” The failure of the Bush policy of direct military intervention with or without any support of “our” allies, was proven to be a failure. (All the candidates last night agreed, for example, about how disastrous the invasion of Iraq was.) Corporate America’s installation of Obama in 2008 was as much about reversing that policy, reverting to a policy of “diplomacy”, as anything. That policy has also resulted in further weakening, as the Wall St. Journal article explains. However, it seems unlikely that the mainstream of Corporate America – the US capitalist class – is ready to abandon that approach just yet. In the future, they will. That is the threat that the Republicans represent, but the Democrats offer no solution either. Not for US capitalism, because there is no solution to their problems. And most certainly not for the US working class. For us, the first step will be to build the movement in the streets and link the various movements together as the tendency for that movement develops to run its own candidates. Candidates who are outside of and opposed to the Republicrat paradigm.